Fifty-three years ago, today, Disneyland opened its doors to the world and began its reign as The Happiest Place on Earth. We couldn't think of a better way commemorate this date than by celebrating the work of frequent Disney artist Mary Blair. Now for a little something that you can't buy or can make (actually, you can make if you're talented and I'm sure some of these folks have online stores). Regardless, you'll have a tough time deciding which "three-dimensional, hand-crafted non-edible play food: crocheted, knitted, felted, sewn, sculpted from clay, paper-mache, assembled from found objects, origami, quilling" is cutest. We're torn over which item makes us smile most, but feel determined to somehow, someday become the owners of this cannoli. John W. Golden (the artist behind the popular "By Order of the Management" series) is holding an Etsyversary BOGO sale from now unti July 23rd. That means when you buy one print, you can get another one for free (limit two free prints per order). Although one of our Nested responsibilities is to narrow down options for our readers, we're at a lost when it comes to picking on the print we're liking best. But if we must, definitely check out the Fido Series and Critter Series. 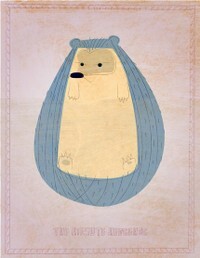 We'll probably be picking up a print of The Hirsute Hedgehog and The Sensible Owl. We grew up in the days when stickers were all the rage -- in particular, we cherished those huge Lisa Frank stickers showing unicorns frolicking and bubble hearts flying through clouds. Stickers were really quite the coolest thing when you're a kid. Well, we all may be much older, but we still love stickers. 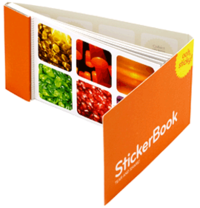 That's why it's great to see that printing company Moo launched their customizable StickerBooks today. 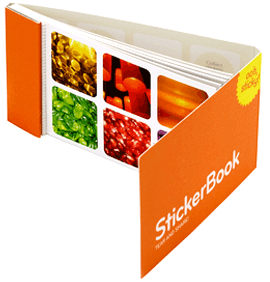 Don't have any photos or illustrations to use for your StickerBooks? You can choose from ReadyMade StickerBooks featuring the art of some great independent designers. The real fun, however, is using your artwork and photographs (from services like Flickr, Vox and LiveJournal) for a custom book. Six stickers are printed per sheet. Moo cards and stickers would be great for announcing that new baby. Check out their inspirations page for more ideas. And right now, Moo is offering free shipping in July. Who Doesn't Love Candy Land? 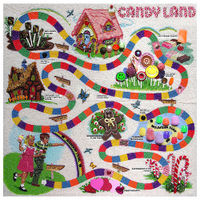 Not something to buy, but definitely something to be inspired by: this piece of Candy Land art using at least 100,000 beads. More about it here. Just amazing. We were reminded of this Candy Land done in beads after stumbling onto a nursery on Flickr that uses board games for decor in their son's nursery. 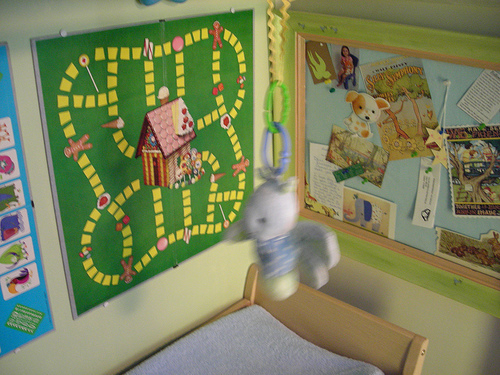 So if you're not ready to invest a year to create some bead-dazzling art, consider hanging up some vintage board games in your child's nusery/room. If you've spent any time trying to decorate your child's room or nursery, you're probably aware that the wall art with the most personality is usually found online and the your options are pretty limited at most brick and mortar baby stores. We love you Babies "R" Us (actually, we really don't), but the matching fabric art to go with the crib bedding and curtains isn't cutting it. We've seen and bought some great stuff online (Sion Lee's art is a good example) but can't help but to want even more options. That's why we were delighted to see iStockphoto offers the ability to purchase prints. 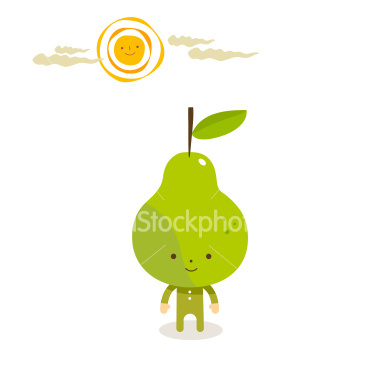 iStockphoto is a photo/illustration stock photo service that relies on the contributions of their members. Because it's user-generated art, the prices of digital are quite affordable (between $1-$10 for most illustration digital files). While most of the art is used (we assume) professionally for online and print work, the ability to get prints of iStockphoto art gives parent-decorators a whole lot more options. 11x14 prints start at $9.95. Here's a screenshot showing how to find the "buy print" link. There are a number of artists on iStockphoto with portfolios suited for the nursery or child's room and it's quite easy to browse for terms and color palettes. 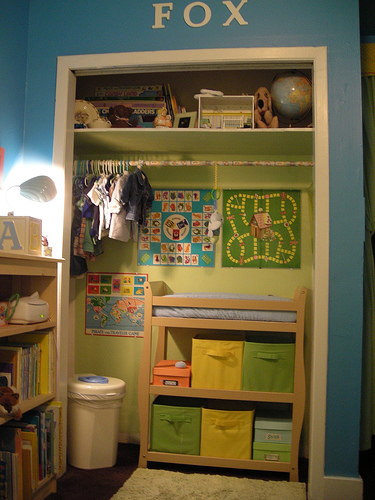 To get you started, here a few images that we would love to see hanging in the little one's room.